When 64-slice computed tomography (CT) systems were introduced nearly a decade ago, they were purchased in large numbers to upgrade older 16-slice systems and soon became the new standard of care. Soon after that boom period for CT, sales abated due to the economic slowdown and the uncertainty of future reimbursements due to U.S. healthcare reform. This made many hospitals think hard about replacing CT systems as frequently as they had previously, with many extending the service life from five years to 10 or more. The conversion to a value-based payment healthcare system and concerns over radiation dose also have changed what hospitals look for in return on investment, cost-effectiveness, efficiency and increasing patient safety. This is the setting as many providers now begin thinking about replacements for their older, first generation 64-slice systems. This article offers a brief outline of some of the newest capabilities, trends and advances of the current generation CT systems. After the introduction of 64-slice systems, some vendors introduced higher slice systems in an effort to improve image quality, reduce scanning times, eliminate stitching artifacts and to freeze cardiac and respiratory motion. Today, several vendors offer premium 80-, 128-, 256-, 320- and 640-slice systems in addition to their workhorse 64-slice models. Critics of these systems say 64-slice CT can accomplish any scanning tasks without the increased price tag of the larger slice systems. Supporters of higher slice systems cite their utility in scanning particular types of patients. With children, the speed of these systems can freeze motion, increase image area coverage, reduce radiation exposure and reduce the need for repeat scans. The systems also benefit cardiac scans, where the motion of the heart and breathing is less of a concern because the scans are completed in milliseconds. The larger imaging area of these systems enable whole organ imaging in a single rotation of the gantry, without the need to stitch multiple images together. In the past few years, GE Healthcare, Philips, Siemens and Toshiba introduced new detector technology for their CT systems that uses microelectronic circuits. This technology reduces electronic noise and enables sharper images. GE, Philips and Siemens also have introduced new detectors to enable dual-energy spectral imaging on their newest generation CT systems. Until recently, all CT systems reconstructed images based on filtered back projection because it was fast and could be accomplished in a reasonable amount of time using older computer technology. However, with rapid advances in computing power and the reduction in costs for that power, all the major CT vendors now offer iterative image reconstruction. This software revises the image over and over with multiple iterations to clean up artifacts and clarify the image pixel by pixel. This enables diagnostic image clarity on low dose scans that was previous not possible. This enables CT scanning at much lower doses that a decade ago. An illustration of how this can impact dose has been seen in cardiac scans, which 10 years ago averaged 20-30 mSv, but today can routinely be performed at less than 5 mSv. Some centers using the latest iterative reconstruction software in combination with the latest scanner detector technology now routinely perform cardiac CT with doses of less than 1 mSv. In August, GE Healthcare became the first vendor with a U.S. Food and Drug Administration (FDA)-cleared low dose CT lung cancer screening option. The U.S. Preventive Services Task Force (USPSTF) recommend the use of low dose CT lung cancer screening for high-risk individuals in December 2013. Additionally, Medicare has now approved reimbursement for its beneficiaries who are eligible for the use of low dose CT lung cancer screening in high-risk patients. GE Healthcare’s new low-dose screening reference protocols are tailored to the CT system, patient size, and the most current recommendations from a wide range of professional medical and governmental organizations. GE said all new 64-slice and greater CT scanners, and most of the 16-slice CT scanners that GE Healthcare sells, are now qualified CT lung screening systems and will include the new screening option. The solution is also available for some GE scanners currently in use. Spectral CT (also called dual-source or dual-energy CT) has the potential to become a major trend in the coming years, as all the major CT vendors are now integrating this capability into their scanners. Similar to the way a prism breaks visible light down into its parent chemical elements on the periodic table for analysis, spectral CT can break down X-ray photons by chemical elements. Spectral CT is based on viewing the same anatomy at two different kV energies. This can be accomplished with a dual-source CT scanner, or newer methods that either use fast kV switching between different energies during the scan, or detector elements that record different kV levels during a scan. Different anatomical features are enhanced at different energy levels. Instead of needing to scan a patient multiple times at different energies to achieve various tissue enhancements, spectral CT allows different energy views to be created from a single scan. Additionally, the spectral software can highlight or eliminate specific chemical compounds based on their atomic number, including iodine, calcium and metals. This allows differentiation between calcified coronary lesions and iodine contrast in the blood vessel. It also enables contrast and non-contrast images to be created from a single contrast scan, since iodine can be removed via spectral filters to create a virtual non-contrast dataset. Applications for the technology include definitive identification of gout, differentiation between different types of kidney stones to better guide treatment, improved metal artifact reduction and clearer identification of pulmonary embolism. The technology aids vascular image interpretation, especially in calcified vessels or in the presence of thrombus. The vendors say additional applications are being researched and all of them have made big investments in the technology in anticipation of its use in next-generation CT diagnostics in the coming years. Philips Healthcare has made a big push for spectral technology in the past couple years and received FDA clearance in September for its Spectral Diagnostic Suite, which offers a set of advanced visualization and analysis tools designed for its IQon Spectral technology. The software offers enhanced spectral viewing and clinical applications capabilities. Siemens has been the leader in dual-source CT for several years, but announced at the Radiological Society of North America (RSNA) 2014 annual meeting it was relaunching its Somatom Definition Edge single-source CT system with spectral capability. The new feature allows dual-energy images to be acquired using a single-source system in clinical routine. GE Healthcare’s Revolution scanner also contains technology to allow spectral imaging. This is enabled via a very fast kV switching system, changing the scanning energy level back and forth between 40-140 kV during the scan using the same detector and X-ray tube. Chest pain is one of the top emergency department presentations and in the current value- and efficiency-based healthcare climate, CT may offer the most cost-effective option to evaluate these patients. Advocates of noninvasive CT angiography (CTA) say it allows for more rapid discharge of patients without coronary causes and can eliminate a large percentage of diagnostic catheterizations and reduce the need for nuclear perfusion scans. Clinical evidence is mounting for the use of CTA as a primary test for chest pain, as scans can immediately show any ischemia causing blockages, and a calcium score can identify patients with coronary disease. Patients without calcium and without any significant lesions can generally be discharged with the need or costs for further cardiac testing or overnight observation. CTA is an anatomical imaging modality, which until recently had not offered functional quantification as to blood flow and perfusion. However, two new technologies are gaining momentum to assist in functional assessments — CT perfusion imaging and fractional flow reserve CT (FFR-CT). All major CT vendors and third-party advanced visualization companies now offer CT perfusion assessment software that tracks the iodine contrast concentrations in the myocardium throughout the cardiac cycle. Areas of low contrast correspond with areas of perfusion defects. FFR-CT from HeartFlow Inc. gained FDA approval in November 2014 and is the first virtual FFR assessment. Currently, invasive catheter-based FFR measurements are considered the gold standard to quantify if a coronary lesion is flow limiting and should be stented. FFR-CT uses a CT dataset processed through a supercomputer employing computational fluid dynamics calculations to accurately assess FFR readings not just for specific coronary segments, but for the entire coronary tree. This technology has the potential to eliminate the need for all diagnostic catheterizations in the future. 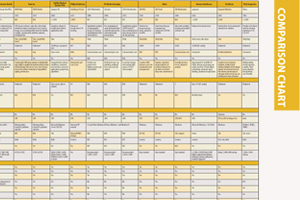 Access the most current version of the ITN CT Systems Comparison Chart (www.itnonline.com/content/computed-tomography-systems). This will require a login, but it is free and only takes a minute to complete the form.